I have so much enjoyed the challenge of doing watercolor painting every day this month. I did work ahead so I could fit it all in and still leae this weekend free for another project. So here are the final 6 paintings. I liked the idea of a sunflower to go with this verse because they lift their faces and track the sun across the sky. I watched a painting video on YouTube one day and then painted this from memory the next. These birdhouses are styled after wonky houses developed by Joanne Fink. I havehad this painting in mind to do for a long time but it was really hard to find a reference photo that would match my vision. I really wanted the tippy-toes and the pose facing away. I finally found a vintage photo that was a good model, even tho it was black-and-white. I used watercolor pencils for this. Haven't used them for a LONG time and had to make myself a little color chart for reference to show what they looked like when wetted. I think raccoons are adorable! I wanted to challenge myself to do something with fur. I used the watercolor pencils again. I did a lot of color blending before applying water brush to blend. I added shading and detailing with black ink and then finished with a white gel pen for highlights. Another personal challenge - paint realistic water. I decided to go entirely monochromatic with this so that the shading rather than color was the defining element. I used only water and Payne's Gray paint. I worked from a painting I found on Pinterest. I did a little detail work with white gel pen. No flourishes on this! But the word is in the verse which also refers to palm trees. I used some new brush watercolor markers to stamp two different palm branches in various greens. I added a second green to each branch with watercolor pencil before blending with a water brush. I made marks with a waterolor pencil in the background and blended them out with water. Then I wetted the whole background and dried with a heat tool. I then outlined every branch with fine black marker. 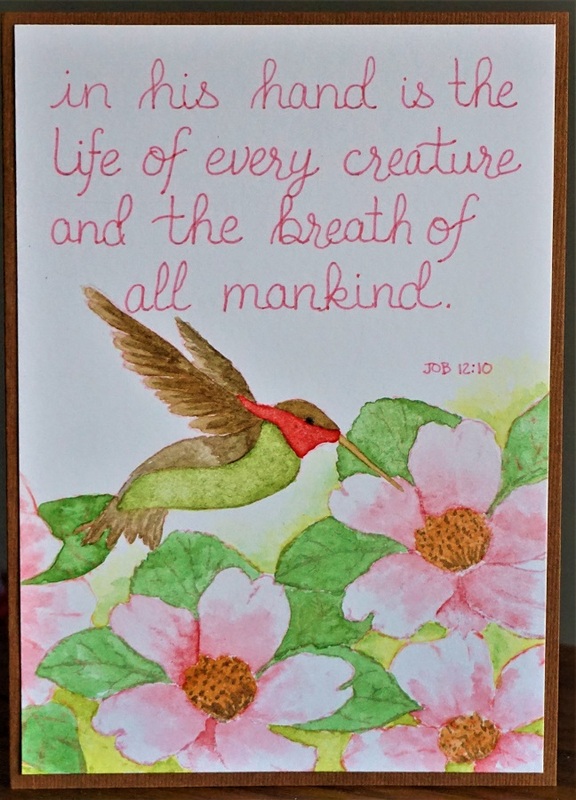 I used the watercolor brush markers to letter the verse on vellum and mounted that over the illustration. And there you have it - 31 greeting cards using watercolor paint, watercolor pencils and/or watercolor brush markers. 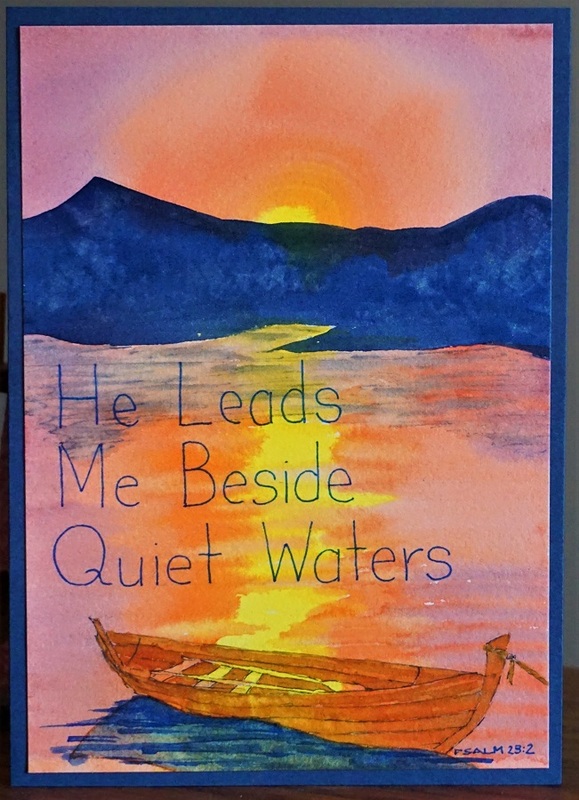 All contain scriptures and were triggered by the prompts provided by Sandy Allnock for World Watercolor Month 2018. Another week of lettering tutorials is in the books. The font I taught has the appearance of being very simple but it does have a few tricks up the sleeve. The font we are learning this week is all about the rules – or maybe ‘about the ruler’. Since it is such a precise font and the spirit of the lettering is dependent on sharp, consistent form we are going to start out there instead of just jumping into writing a word. First, the guidelines. You’re going to want paper that has some kind of unit for you to follow. 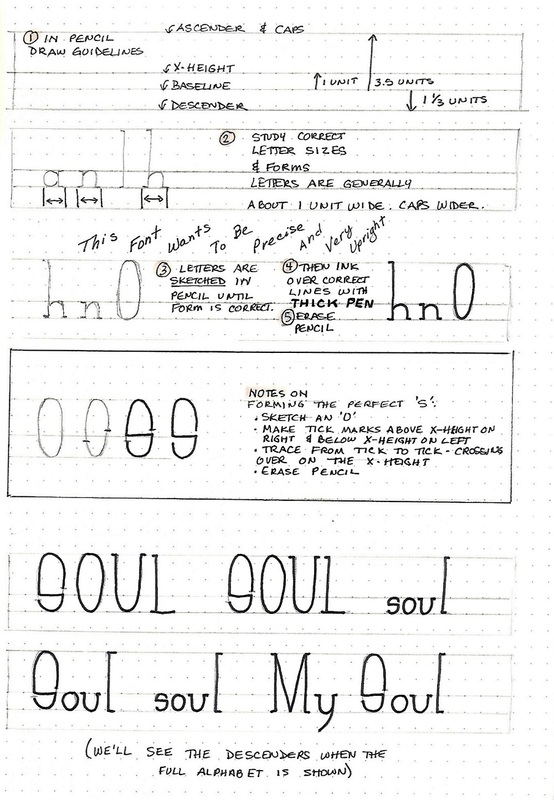 I used dot grid but you would do as well with graph paper or a narrow-rule lined paper. First line to pencil is your baseline. The x-height is one unit above this. The ascender/caps line is an additional 2.5 units above this (3.5 units above the base line). The descender line is 1 1/3 units below the base line. SEE THE FIRST LINE ON THE ILLUSTRATION FOR REFERENCE. Next, we address the letter widths. With some exceptions which will become apparent when we see the full alphabet, letter width of lower-case letters are about 1 unit wide and upper-case about 1.5 wide. THIS IS SHOWN ON THE SECOND LINE IN THE ILLUSTRATION. Now, for working methods. Note on LINE THREE IN THE ILLUSTRATION it is important to sketch each letter in pencil. Don’t go with your first marks necessarily but make little corrections to the form until it is just right. Ink over the final lines and then erase your pencil. You end up with perfect lettering! And, finally, there is one special letter that takes a few extra steps to get just right. So, IN THE BOXED AREA ON THE ILLUSTRATION take note of the correct formation of the letter S. Sketch an O, make tick marks as indicated, trace from tick to tick and cross over on the x-height guideline, and erase the pencil. READY FOR SOME LETTERING NOW? The focus word this week is SOUL. Write it out in various upper/lower-case versions. You can also practice some of the letters used in the instructional portion since this word only has four letters to play with. None of the letters on today’s page have descenders, so we’ll see those in the full alphabet lesson tomorrow. 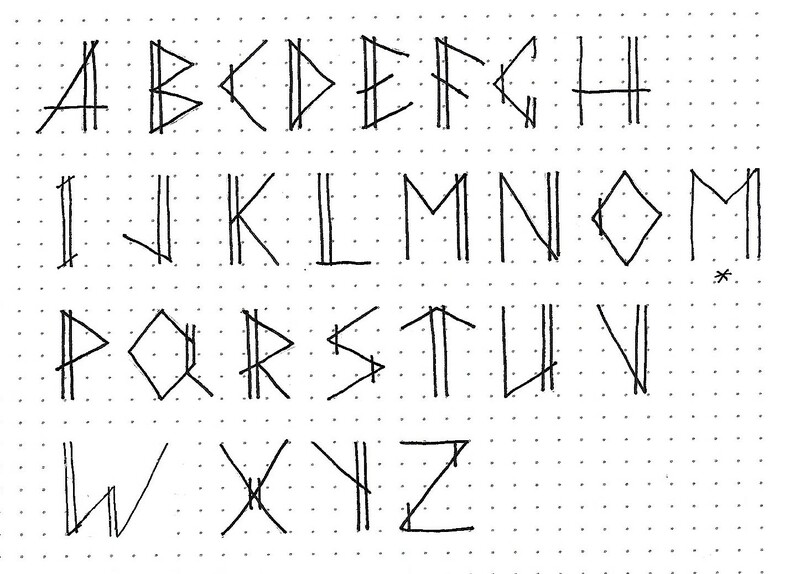 This alphabet is based on a free font called SmallTall. I added a set of numbers without referencing the original font so those are mine entirely. Note that straight letters have a set of half-serifs to define the top and/or bottom. Exceptions are the capital ‘I’ with full serifs, the capital ‘T’ with none and the ‘Z’ with none. Curved letters do not have serifs for the most part. Exceptions on the foot of the ‘h, m, n’ and the top of the ‘g, j, u, y’. there are few descenders. Two are extensions of the straight line with a half-serif like the ‘p, q’ and the remaining three are matching gentle curves with no serif. These are ‘g, j, y’. So only 5 descenders in total. I threw in a reminder on forming the ‘S’ so you wouldn’t have to keep referring back to page one. Note that the lower-case ‘s’ can be formed the same way. Its internal crossbar is straight across rather than a curve or slant like one would normally write. Now, go forth and letter. It’s good for your SOUL! 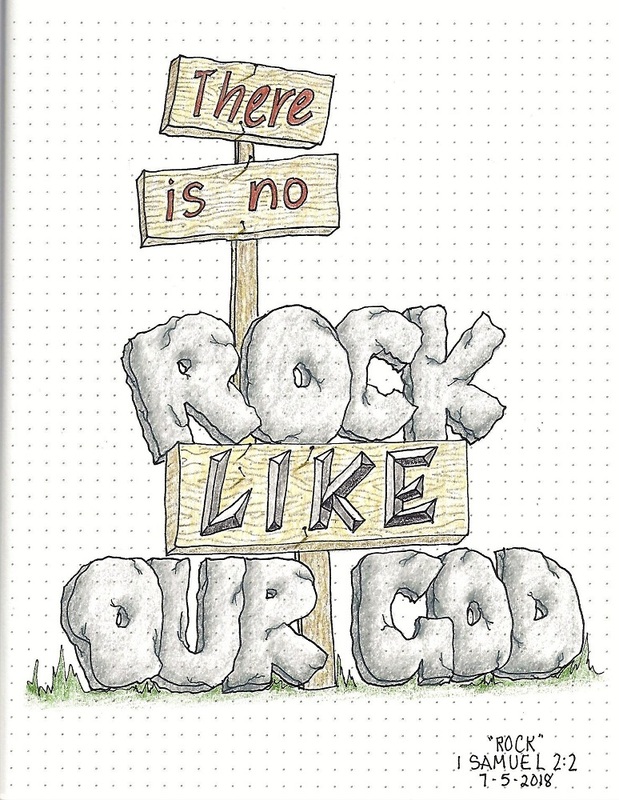 I used lyrics from the song ‘Anchor’ by Hillsong for a practice sheet today. When you write out a long block of text it looks better to capitalize every word. I use all caps for key words. You can see I used a version of this font for my reference though I condensed the height of the upper-case letters. This makes it blend in but not compete with the main text. Practice your lettering with a quote, song lyrics or poem relating to the SOUL and share your work in the Photo Album. 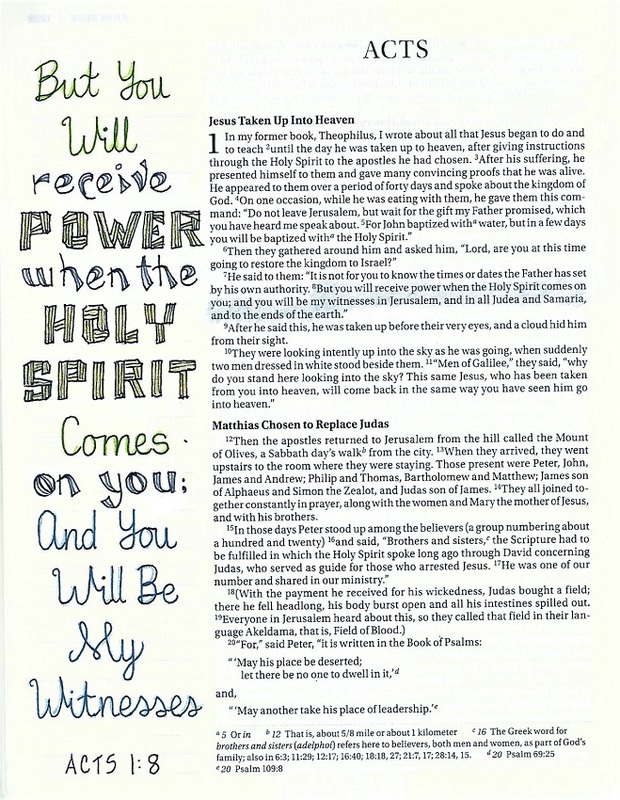 Today we move into using our font for a scripture on practice paper. I spread out the lettering on my page and used a winding rope to provide a flowing guide for the reader. Whether you add rope or not, letter a scripture on practice paper and share your work with us in the photo album for Lettering Lodge. This is the day we use our newly-learned font in our Bibles. 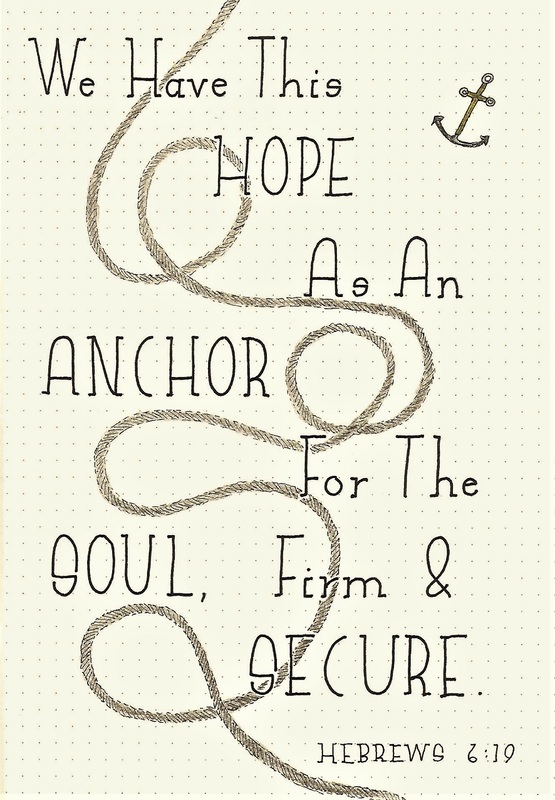 I really wanted to use the same verse as yesterday with a drawing of an anchor but I already had done that in my Bible. 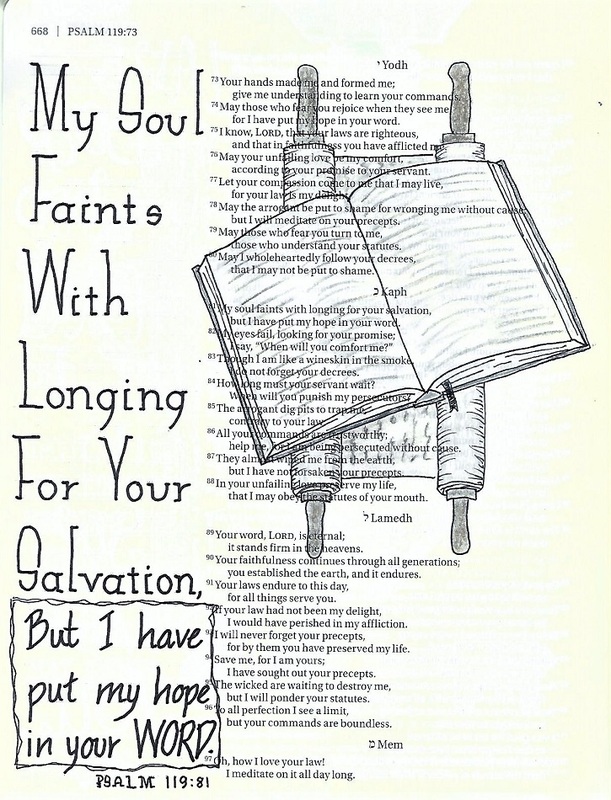 So, I switched up for Psalm 119:81 and illustrated with an open book (Bible today) and a scroll (Bible in David’s time). This font eats up a lot of vertical space so you might have to mix in a more compact font to supplement it. I did that at the bottom. I think I will use this font a lot as it is a style with versatility. In face, I already used it on one of the watercolors I did this week (blue bottle). 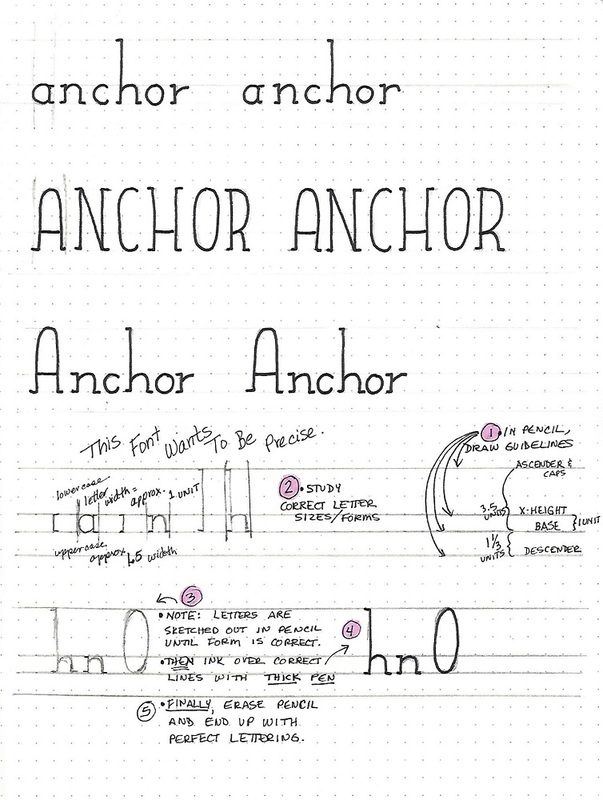 When I was writing this lesson I started out to do the focus word 'anchor'. Then I discovered there were not very many scriptures with that word that were something that I would want to journal. That's when I changed it to Soul based on some of the samples I had already done. Off to do more artwork. What shall I work on next???? Seems these entries are coming one on top of another. I'm doing two a day still as I have something coming up at the end of the month and don't want to be caught short. I painted this one from a picture found on Pinterest and I've decided I want this place for my very own. I've been seeing other people try a technique for painting galaxies that uses rubbing alcohol sprayed on wet watercolor paint. I took it up a notch by sprinkling with table salt after it was partially dry. I am having SO much fun getting back into watercolor painting and trying out new techniques to get the result I want on each one. Now that I'm back from my short vacation it is time to catch up with the watercolor paintings for World Watercolor Month. I actually did the sketches for these while I was away so it was quicker to get on track here at home. I used a glitter gel pen over the top of my lettering. The wings and tops of the heads got a line of glitter as well for some shine. I started out with the concept "if you as fathers know how to give good gifts to your children..." but when I had the gifts done I switched it up to represent giving to others. I love this scripture and felt the theme of 'blue' represented sadness and heartache that led to tears. So I used my own hand as a model for one pouring tears into a blue bottle. Challenge to paint daily with watercolors continues wo the end of the month. I found I was not going to have time to paint for a few days this month so I've beed doubling up and doing two a day for a few days to bank the paintings. I realize that kind of defeats the 'paint every day' spirit of the challenge but at the end of the month I will still have 31 paintings, so I'm good with that. I had a bunch of watercolor papers that I had gotten as sample packs from two vendors years and years ago (maybe 20?). So I've been cutting them down into the 5x7 size I've been using for this series. Some are thick, soe thin, some smooth, some textured, some have sizing and some do not. I just grab whatever is on the top of the pile and figure out the best way to paint on that particular paper as I go. Well, I think I got the 'pink' theme down well enough. The flowers are a rubber stamp imprinted with a very light ink. This technique is called no-line watercolor because the stamp ink disappears into the water and paint. The background of this is made with bubble wrap! You wet the paper, put waterbased stamp ink on the bubble wrap and press it to the paper. It spreads out into the wet paper. I brushed over it with very light watercolor paint to blend and let it dry then drew in the honeycomb lines. More paint went over the background areas. I used a glue stick to adhere flecks of gold foil randomly and painted two bees. Not my favorite but I ran out of ideas on how to make it look like I wanted. In case you can't tell, it is supposed to be a shaft of light coming from between dark clouds. The three big challenges I've always had with painting are 'metal', 'water' and 'glass'. I do believe this is the first time I have had success in painting glass! The very next day I had a success at painting water! Woo Hoo! Two in a row. If you've been around long at all, you'll probably recognize this hummingbird as my handcarved rubber stamp. I added stamped magnolia blooms and then had to draw in a couple to fill in. This was done in the style of no-line watercolor. Well, look here! I've successfully painted metal. My big three bugaboos can go hang out somewhere else. I can do this! Now 'shiny' metal may be an entirely different story. I took the prompt and added 'COFFEE' to it! Although this illustration looks like a rubber stampI actually hand drew the whole thing from scratch and used the watercolors to bring it to life. Not quite halfway through the assignment. I'll do a couple more and then take a break for my other scheduled activity before posting. 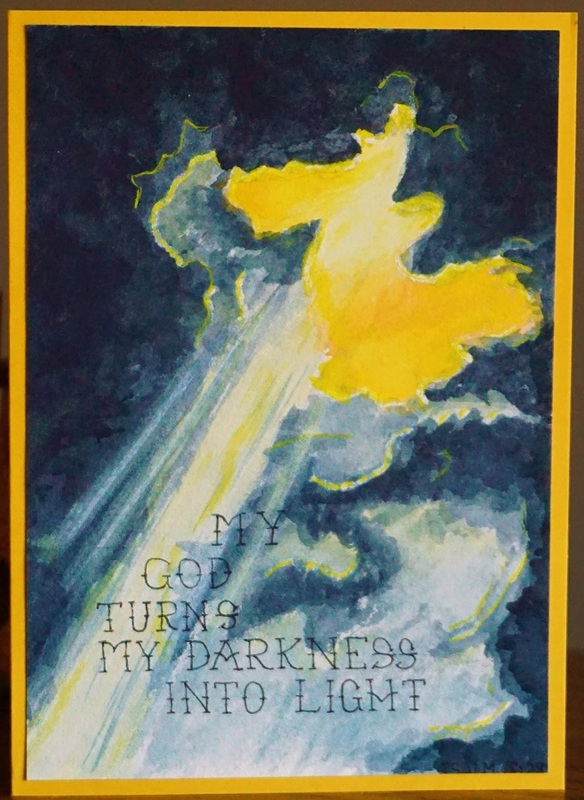 I have another three waterolor paintings completed for this challenge. Still finding it a challenge to figure out what to paint. After that part the painting has been easy so far. 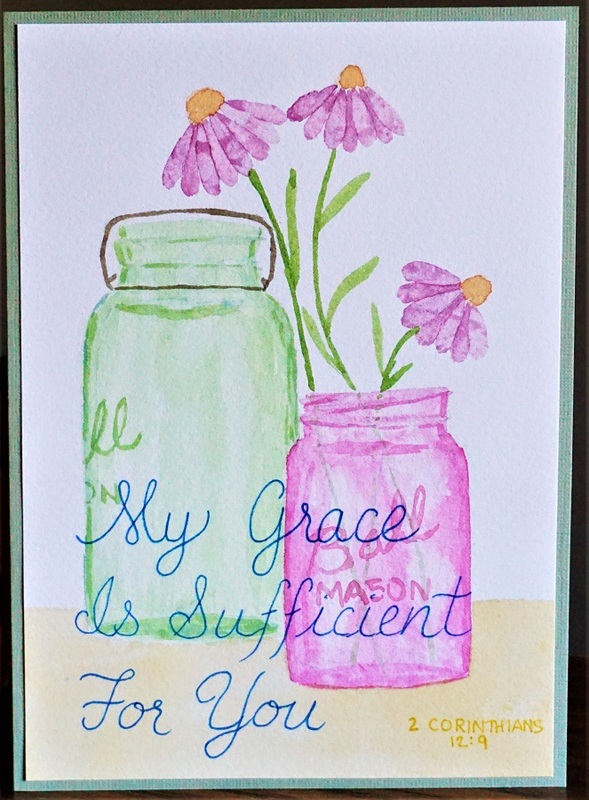 I didn't use a scripture on this card, but a quote. The roses on this card are my own handcarved rubber stamp. The lettering is gold gel pen. I went with sprouts as my reference to the prompt. I can listen to one disc of an audiobook while painting one card. Postings will continue every few days. 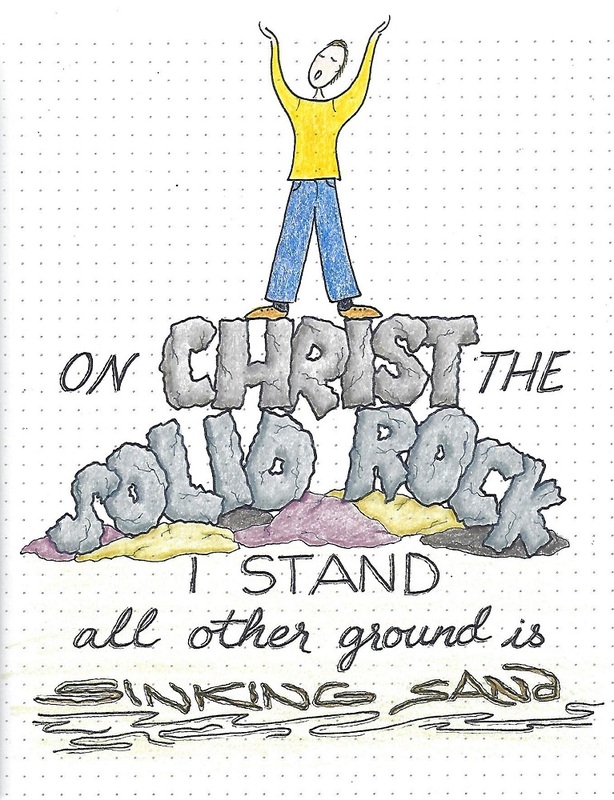 The lettering lesson from Ann this week (CBJ - Creative Bible Journaling Facebook group) was a great adventure through creating letters out of rocks! 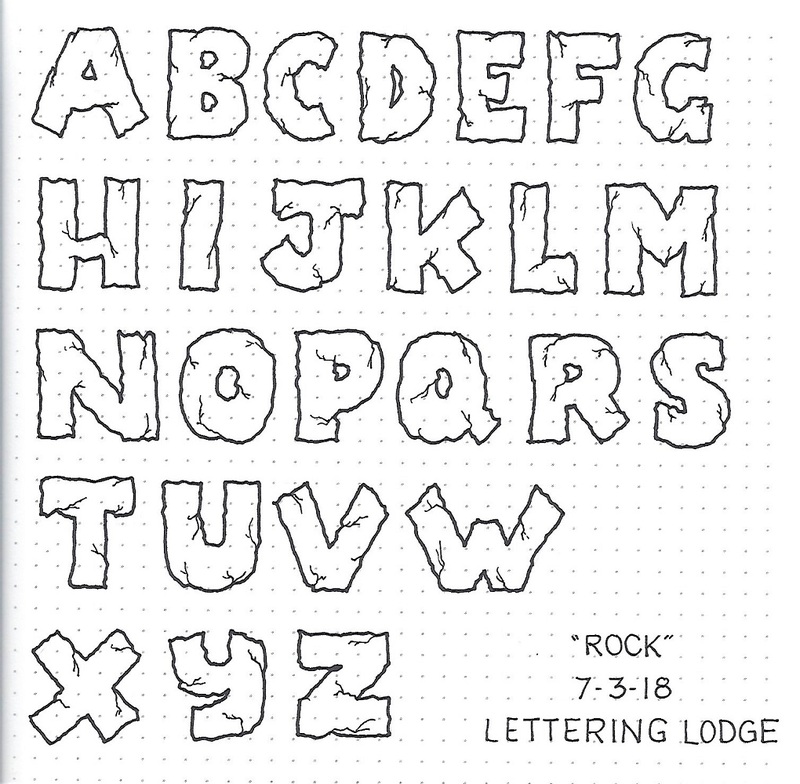 Ann's lesson was more basic lettering but I boosted mine up to the next level by adding little features and shading to make them more stone-like. 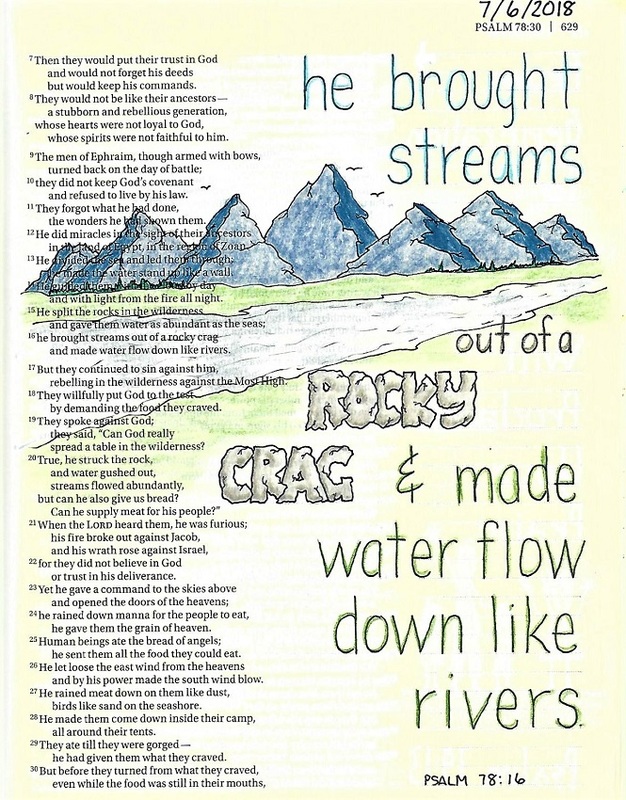 I won't have a separate post for the Drawing Room lesson this week as I used the lesson (How to Draw Mountains) on this same Bible page. 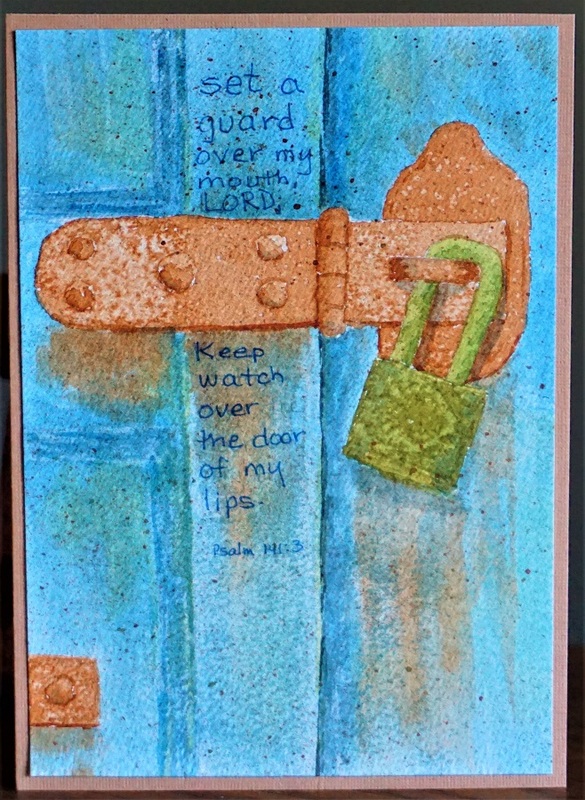 I signed on to a challenge to do watercolor painting every day for the month of July. A whole three days and I'm still on track! We'll see how long that lasts while I have some time away on a couple of weekends. So far, I think the biggest challenge has been coming up with bible ideas related to the word prompts. I went with a night sky in which I used salt to create random white spaces. After this was dry, I brushed away the salt and added little yellow dots to many of these spaces for stars. After painting a grassy field to do the lettering on, I added gold glittery gel pen to just a few of the yellow dots. I used my own glasses as a model for this painting. But I had to take a picture of them to work from because, with them off, I couldn't see to draw or paint them. I don't know why it took me so long to make the mental connection between 'red' and 'rubies'. I had been wanting to draw or paint some gemstones for a while now so this was a great time to do it. I found a blog that gave some tips on painting gems in watercolor and used those suggestions to great effect. It wasn't until I got these three cards lined up together that I realized that I had used the same layout for all of them. I have been using lettering styles from the Lettering Lodge on these. 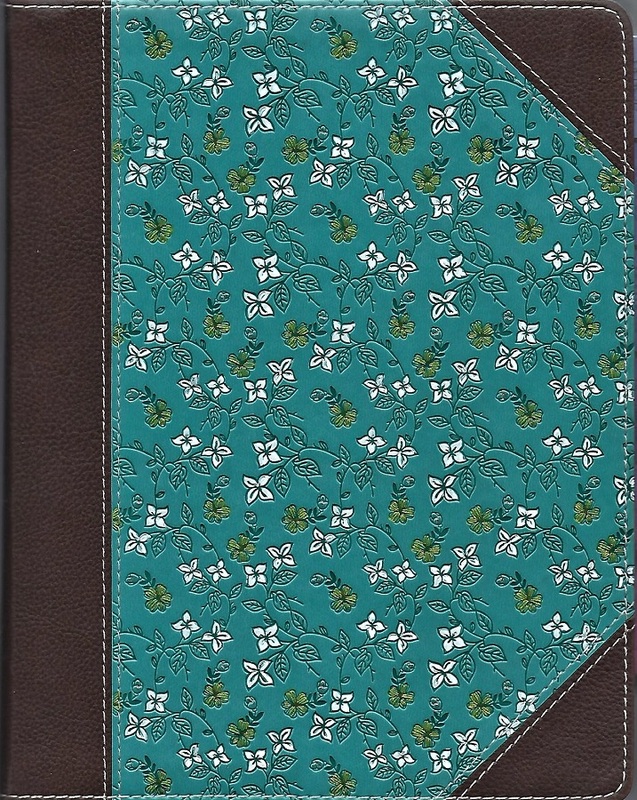 The journaling bible I have has a tooled cover in teal. I got it in my head to add some color. I turned first to a white fine-line Sharpie paint pen. I used this to color the open flowers. This worked well because it is essentially acrylic paint. Next I used a gole glitter gel pen to color in some striped flowers. I don't know what kind of 'paint' it is but it stuck well. Finally I used a shimmery silver gel pen for the buds. After the ink was dry a swipe with the hand left the silver but took away the slimmer of it. I haven't decided if I will find a green to use on the leaves. I want to see how it 'wears' the way it is as this is the bible I carry to church every week. And with a big sigh, I end several weeks in a row of being on duty for lettering tutorials. The other leader will take over this week. Last week, I taught a series on the word 'Purity'. The lettering lessons this week will demonstrate and teach an elegant print font I’ve titled ‘Purity’. 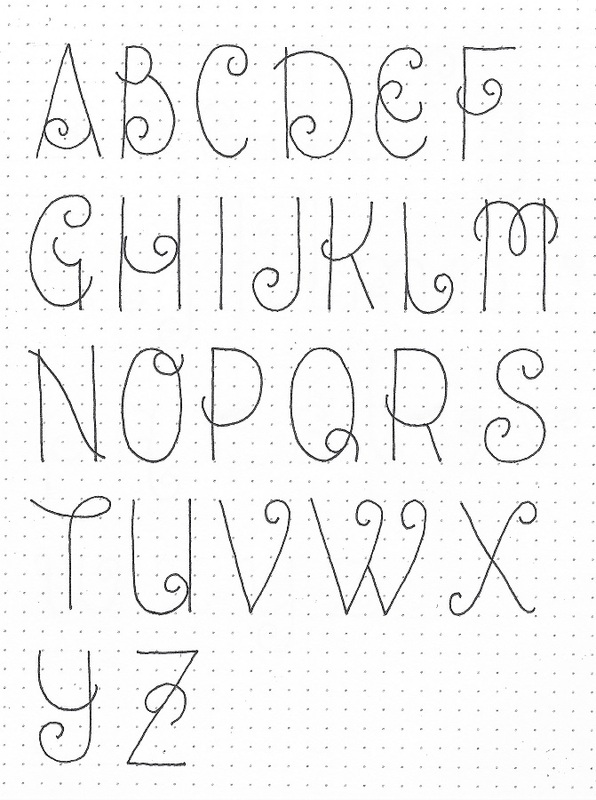 The upper case is prettied up with some double lines and single and double loops. The lower case does not have any of these elements but echo the bent ends of the lines at top and bottom. AIM FOR CONSISTENCY in the size and angles of your features and in the spacing between your double strokes. Practice with different forms of the words: pure and purity and do some with all caps and some with mixed-case. 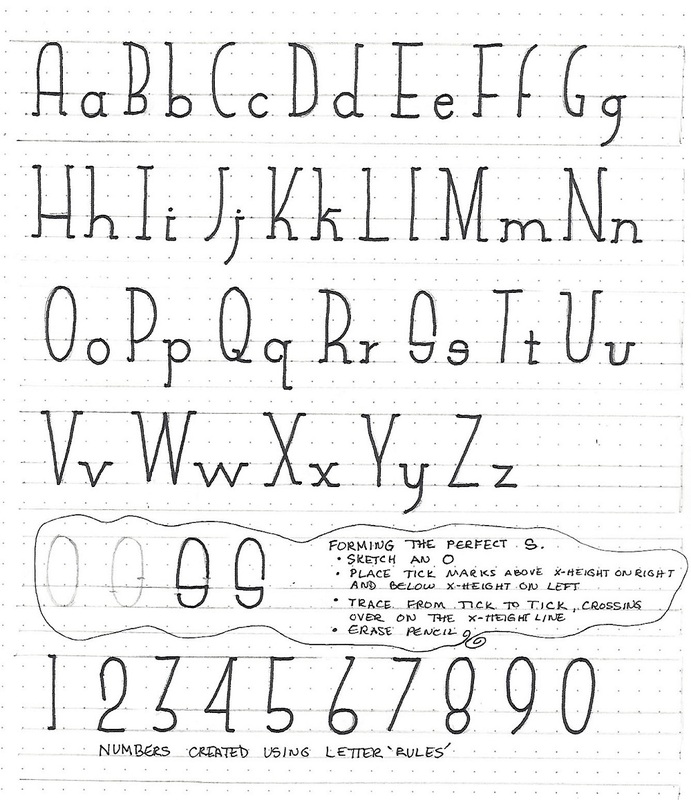 Before you start drawing your alphabet, make yourself sets of guidelines in pencil. See the ‘clouds and box’ at the bottom of the page. The only letter I think could use some tweaking is the upper-case Y. If you have a form you like better, draw it in and share it with us. Don’t let all those loops intimidate you! 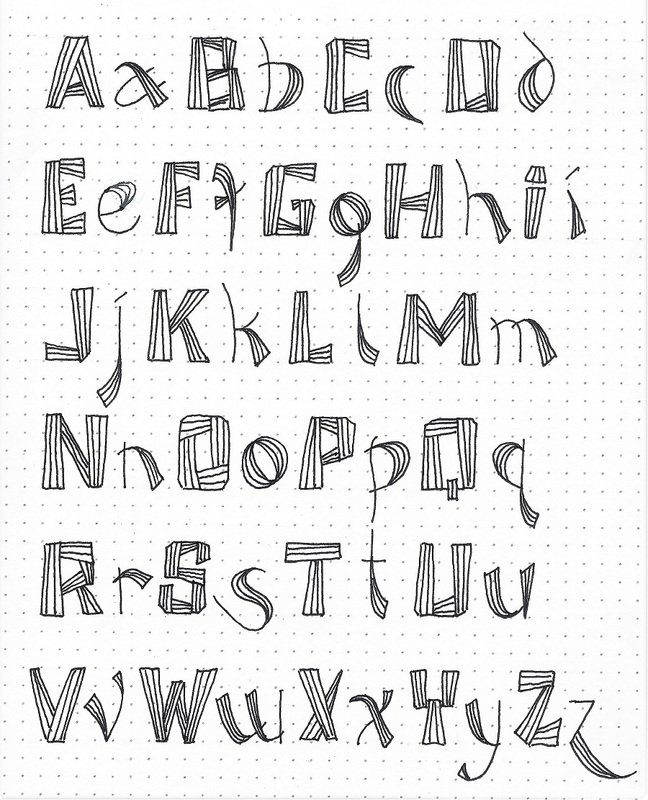 Over all, this alphabet looks complicated and hard to draw but it is really very simple – just take it one step at a time. It will look very elegant when you are using it. 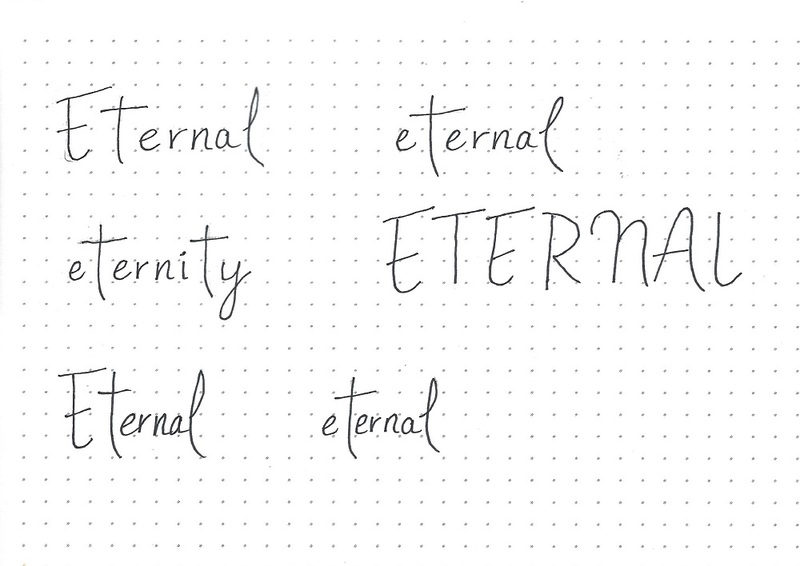 Today, use your new font to write up a word list that reflects one of the forms of ’Purity’. I made mine into an anagram but you could build a crossword or a quote. Just play! The goal is to get some practice using the font and getting a feel for letter spacing. Although it would be a LOT of work, an alternative would be to use ALL caps. It’s Friday already! Time to use the new font in our Bibles. I did part of my verse with the featured lettering and supported it with an elegant script. Except for that last word… no way did I want that to be either elegant or represented by the ‘purity’ font. It just got ugly writing. I used a bright color burst from the feature word. Did you notice the heart is formed from the word ‘Pure’? Another tutorial in the books. Yep, it was still my turn for lettering lessons this week - and it will be for next week as well. Today we begin a lettering style that is a combination of two alphabets – one for the upper-case (more squared) and one for the lower-case (with graduated swooshes). 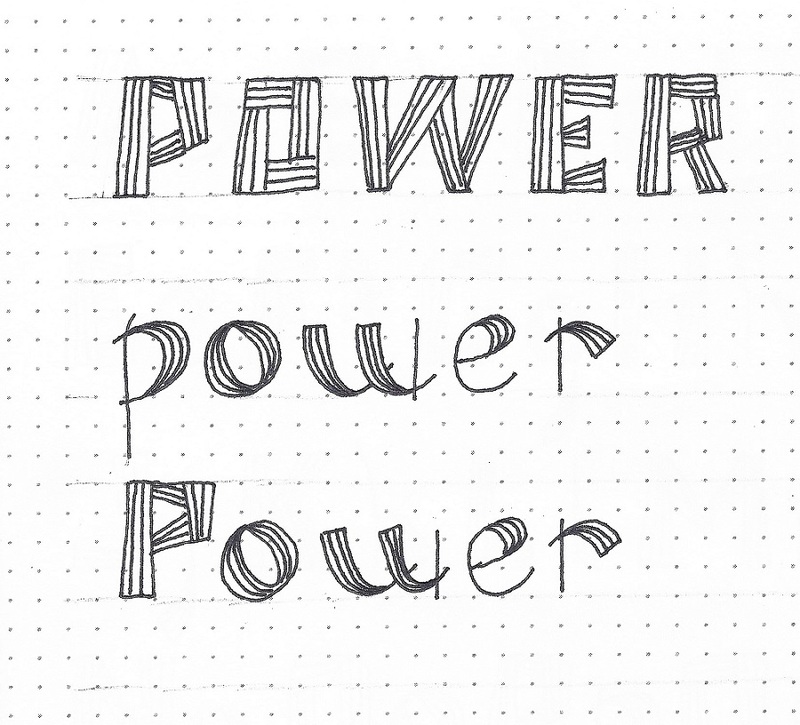 We’re using the focus word ‘power’ which we’re building with letters that resemble boards. I sketch the outer shape of the letters in pencil and then define where the ‘boards’ will overlap and intersect. I wait until I have the whole word written and inked before I add the decorative lines. You may have room for three lines internally or maybe only two. Just do what works without going down to one internal line – it just isn’t enough. On the lower-case letters look at how the boards have become ribbons. Also notice the overlap extensions on their intersections. I will say that this is NOT a complicated font, but it IS time-consuming. Just sayin’. Are you ready for some POWER? In the full alphabet you’ll begin to notice that some of the upper-case letters that are normally rounded have their corners chipped off to accomplish that shaping. The B and the S are the most complicated structures. If you can simplify them, you are welcome to do so as long as it still reflects the style. The most unique letters are the D, f, g, and Y. Remember that the upper-case is all straight lines, the lower-case is all flowing lines. How do you feel these two alphabets suit one another? 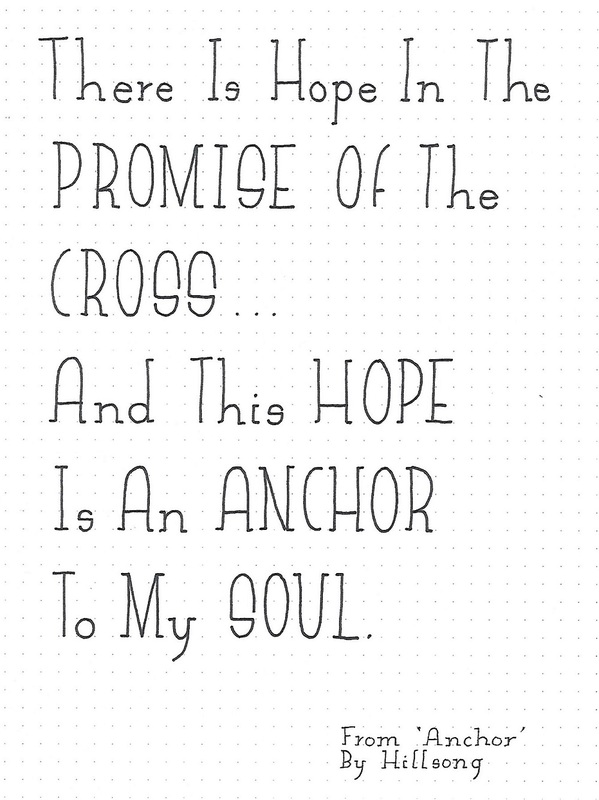 This old hymn kept playing through my head as I studied this lettering style. I think the words look better if all the letters are either upper-case OR lower-case rather than mixing them. I threw in a few words in very basic printing, as well. Don’t be afraid to mix styles. Some are just too much for a long project and can be used as a ‘key word’ accent instead. I also used colored pencils to add some zip to my letters – colors are separate for the cases. Choose a ‘power’ful song lyric for your own practice piece. 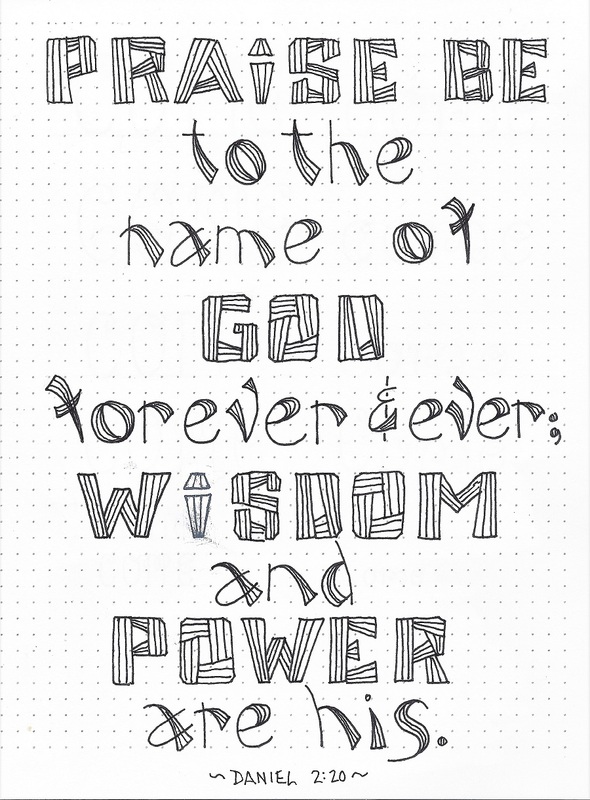 We’ll use our new lettering style today to write a scripture in our workbook, journal or on a plain piece of paper. I found that this style does not scale down easily as you need those spaces to be open to get the extra lines in. 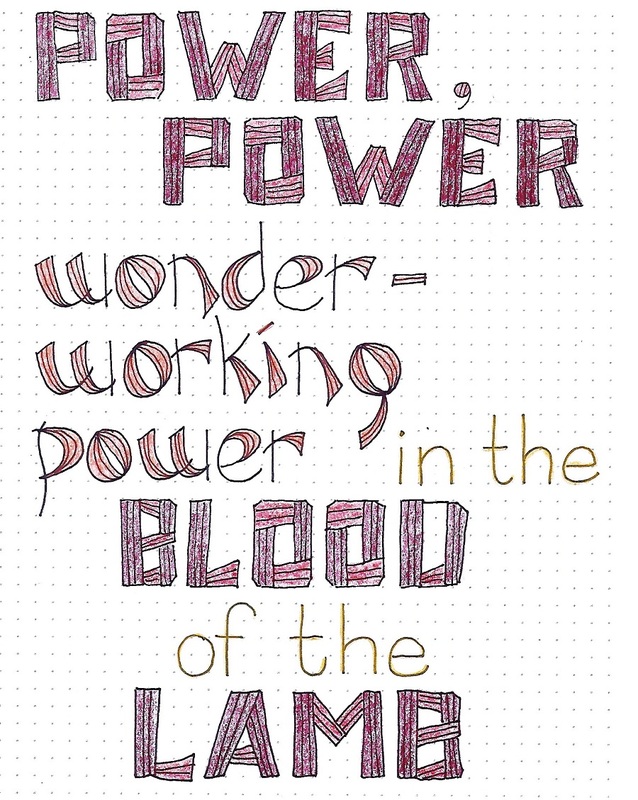 Well, it’s finally time to use the ‘power’ font in our Bibles. I wanted to only emphasize a few words so I used the upper-case on those, then I surrounded those with the lower-case and completed the rest of the verse in a simple script. This script does not compete with our ‘power’ style but is still fancier than a basic print. And, yes I did change up the letter ‘I’. I went over all my script letters with colored pencil and colored in the upper-case of this week’s style. Stay tuned for another lettering lesson next weekend. Last week I was on duty for teaching another lettering lesson. The Facebook group was also running a guided tour of the whole layout and activities of the site so there were a lot of new letterers following the lessons. Many people on the tour may be new to hand lettering so I thought it might be time to go for something more relaxed. This style only looks complicated because of the curls everywhere but it is based on a simple print. There are only 4 letters to practice with today – 8 if you count the upper- and lower-cases separately. In the top two examples we are working from a 5 unit height (units would be lines on your paper or grid lines on graph paper or dots on a dot-grid paper), the x-height is 3 units. Look how the upper-case E takes up 3 units for the top half and 3 units for the bottom half. For samples 3 and 4, I worked on a 4 unit grid height and made the x-height half (2 units). Either scale works as long as you are consistent. The third set is half-scale of the second set. 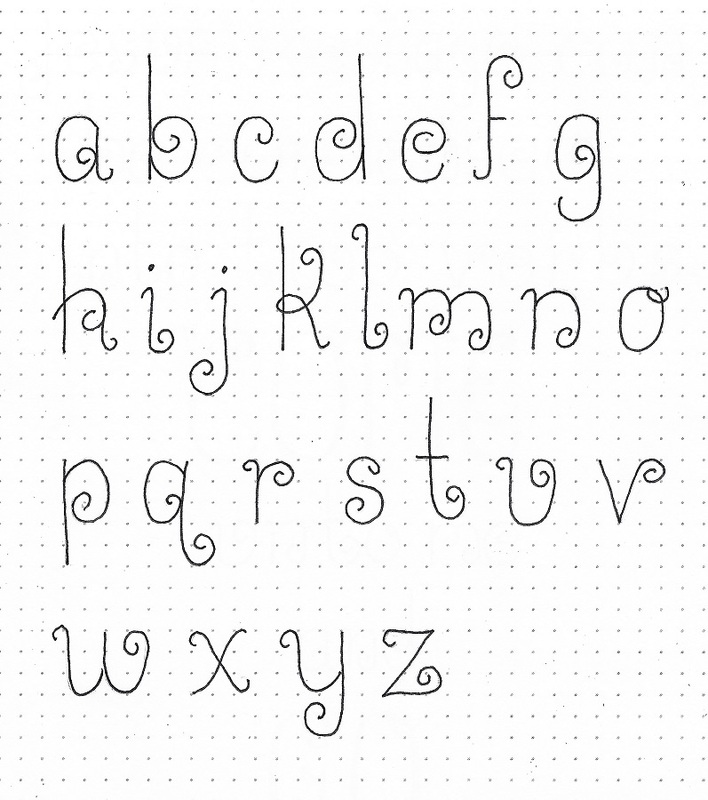 Draw the basic shape of the letter first (in pencil of course) and then come back to add the unique stylings and finally, the curls. Ink only after you have the letters fully drawn out and, after the ink is dry, erase the pencil. 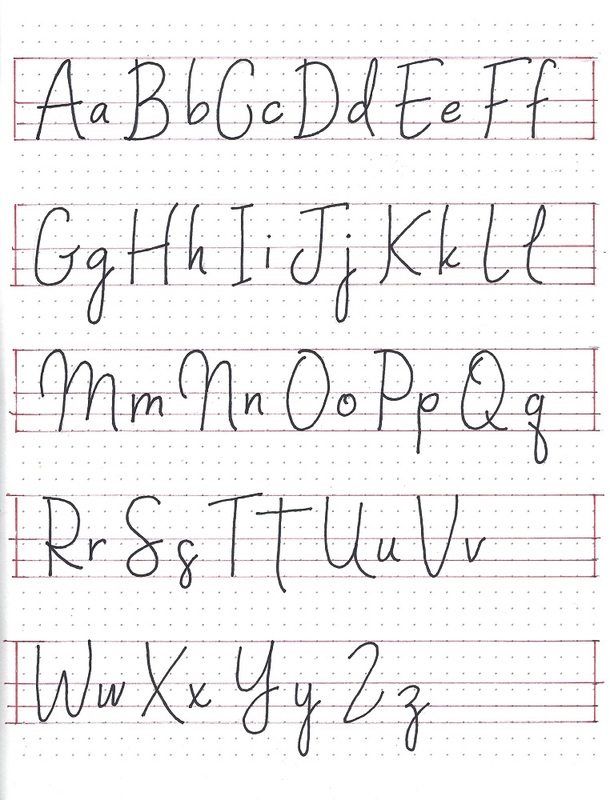 Today the upper- and lower-case alphabets are on different sheets. Start by working large when learning a new alphabet style. It easier to scale down after you learn it than it is to learn small and scale up. As we did yesterday, pencil the basic shape of the letters (all of them) then come back through and add the unique stylings (like the double curls on the E, the loopy top on the M) and then go through all adding curls. This will help to get the size and shape consistent and will help you make the curls a consistent size. Then, go through and ink each letter in its intirety in order. This will set the letter style in your mind as a whole unit. Erase the pencil after the ink is dry. NOTE: The alphabets may not appear in the same visual size scale. Use the grids for proper size ratios. When our pastor related a quote from Billy Graham recently, I was struck by it and had to come home and look it up. For reasons of space, I modified it slightly, but the message is the same. 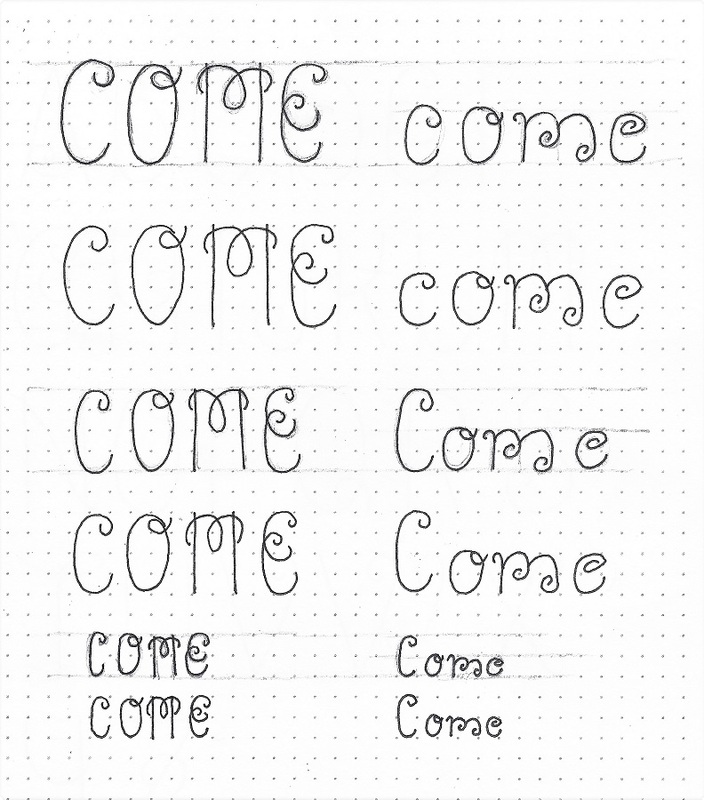 Use the ‘come’ lettering style to write your choice of a quote or song lyrics containing the word. I like to see quotations centered on a page. I often write out the basic form in left-hand alignment and then mark the center of each line separately. Then on my ‘finish paper’ I mark the center line of the page. I use a lightbox, light pad or window to align the various centers line-by-line and trace over the basic forms in pencil. Then I go back and add the styling elements and curls. Rather than a black pen, I used colored markers to make the finished letters. After erasing my pencil, I used a second color of marker to add shadows under and to the left of my two key words. What will your practice page say? 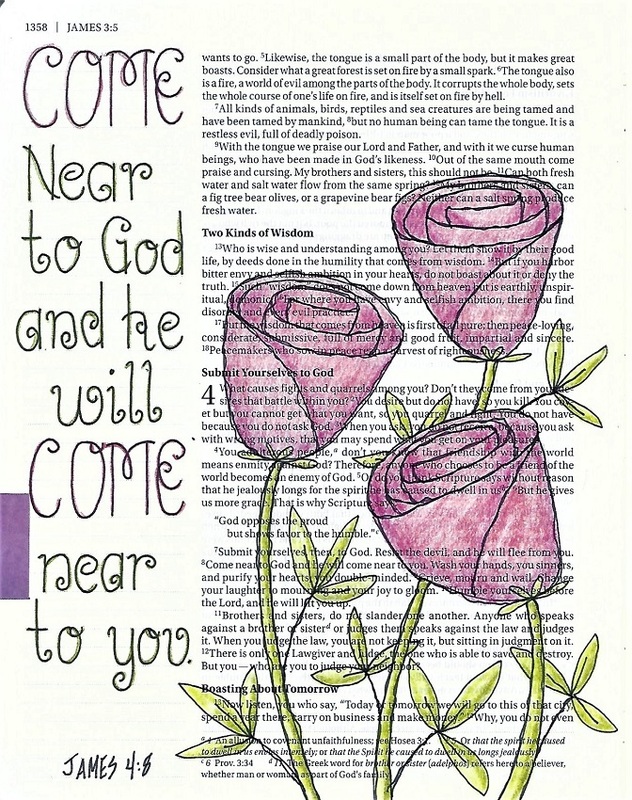 Today we’ll find a scripture with the focus word ‘come’ and write it up in our workbook, journal or just on plain paper. The more you write with a new style the more it becomes fixed in your memory. With enough use, those letter forms will just flow off the pencil. I used the same centering techniques as shared yesterday and even used the same set of markers. 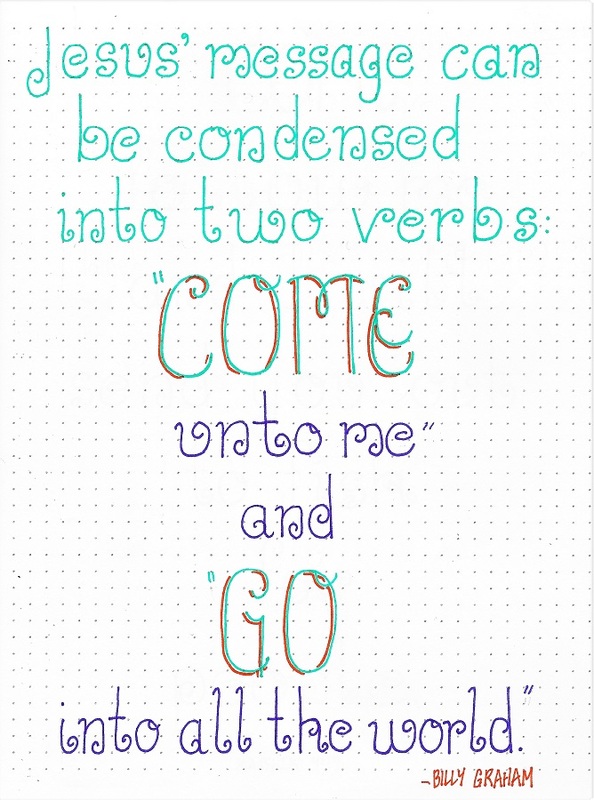 This is the day we take the ‘come’ lettering style into our Bibles. Don’t neglect this step in the learning process. It is, after all, the ultimate point of teaching all these awesome designer letters. The process is the same for preparing to letter in your Bible, pencil first with basic forms to establish layout and spacing, enhance the letters with their embellishments and curls, then ink and erase the pencil. 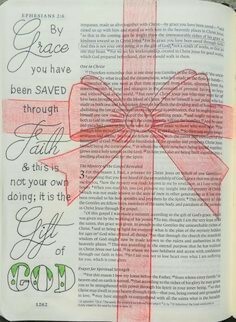 If this is scary for you, add another step – do the designing and layout and lettering on scratch paper (grid or dot-grid) until you are happy with it and then trace it into your Bible. Do the tracing lightly in pencil and then do the inking and erasing. For those who wish to use flowers like these, they are from the Drawing Room lesson on Wednesday of this week. But, just because I’ve done artwork on my page does not mean you have to do so. These letters are beautiful enough to stand on their own. And it really IS all about the words. So another week of lessons is in the books! 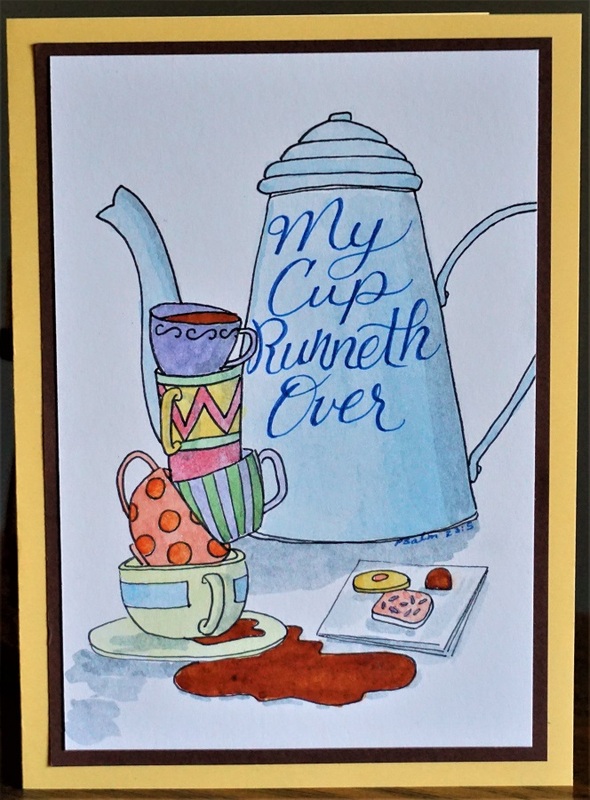 I guess I missed posting links to a couple of the Drawing Room lessons that I illustrated for Creative Bible Journaling. We'll start with the one posted today. 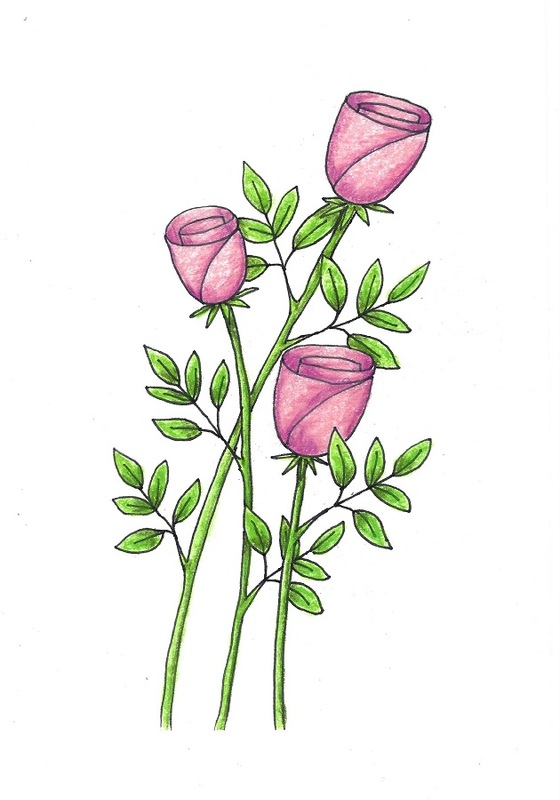 Click here: http://creative-bible-journaling.com/drawing-room-dr216-spiral-rose/ for a lesson on making this spiral rose. 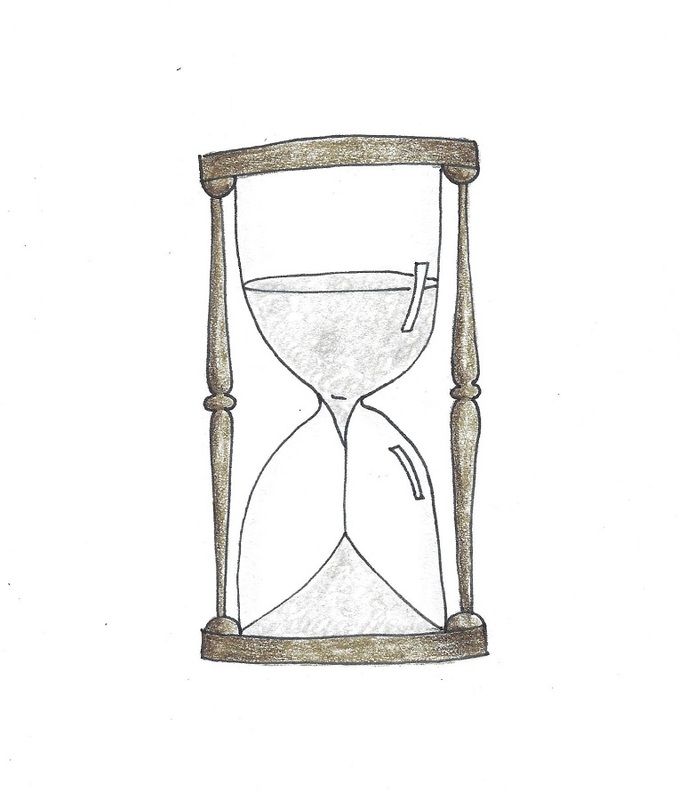 The week prior I taught this hourglass. 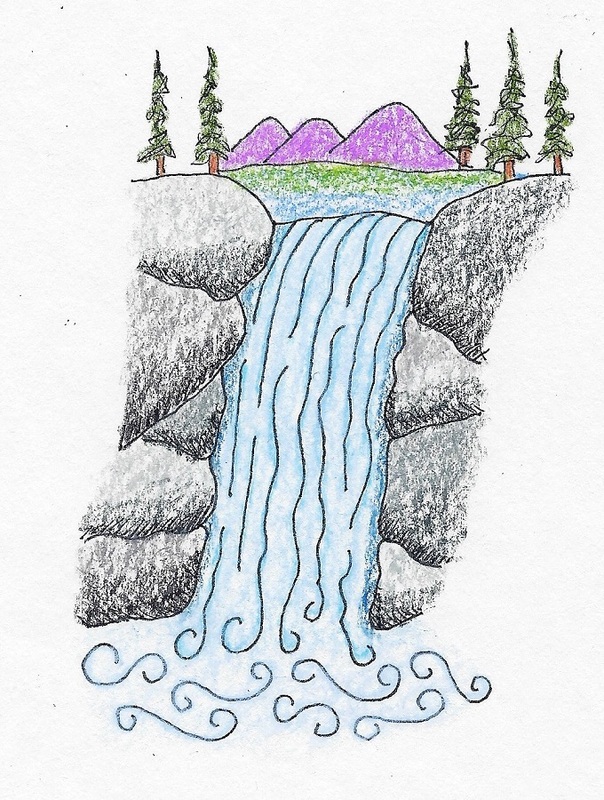 Now I can't remember if I posted the lesson for this waterfall! Hope you enjoy following these lessons. 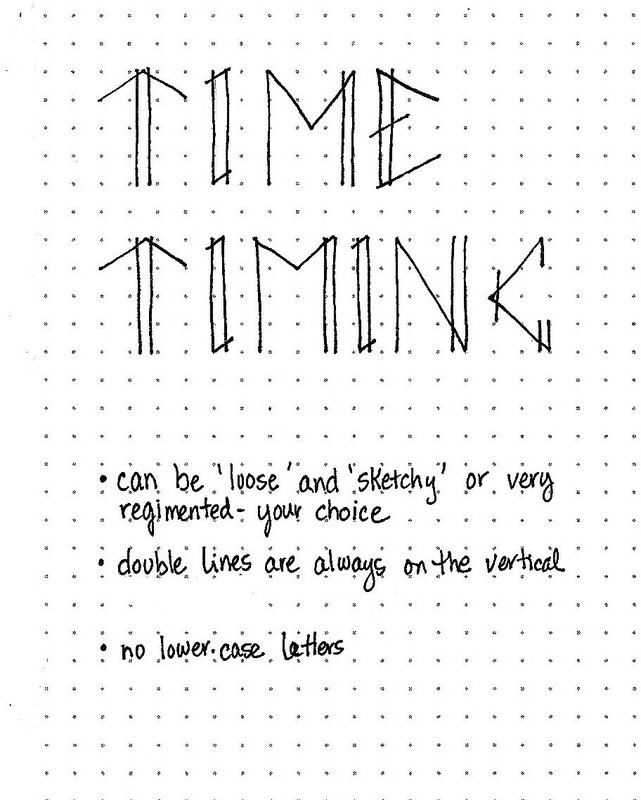 A few weeks back someone suggested we develop a lettering style that used double lines. So I did an upper-case only and prepared the 5 days of lessons for it. At the end of last month my co-leader was having some family health issues and needed some time off. I offered to pick up this last week for her. But when I got ready for the first post, she had forgotten about that offer and had prepped the 'teaching' font we just completed. I had to laugh because we had both planned on the double-line fonts for the same week. Don't you love God's sense of humor? So I did mine as a 5-hour class instead of a 5-day class and posted it in the lobby of our site instead of the Lettering Lodge thread. I posted one lesson each hour on Friday night and got lots of attention from people who don't seem to dig down into the threads for lessons. So, here is the font I developed. Again, I did only an upper case. Mine is all straight lines where Ann's has lots of curves because it is based on a standard print. I had such fun developing this print style. This print style has no lower-case. All those angles and double lines can be treated very loosely or very structured and precise. It’s your choice. All of the double lines are on the vertical – never on an angle or horizontal. This gives a tall linear vibe. Every letter gets just one double. Our second lesson is always the introduction of the full alphabet in the new lettering style. Note how there are no curves at all in this style. Those angular lines remind me of the hands on a clock which is what led to the focus word ‘time’. There is an alternate letter M as I wasn’t sure if I wanted a deep or a shallow V on the top of it, use whichever one you like best. My favorite letters are the G and Q. For our third less we give an assignment to do something creative with the new lettering style. Sometimes it is writing lyrics from a hymn or chorus, sometimes we do an anagram or crossword, other times it will be a quote. These will all use the focus word or be related to it. The intention is to give ample opportunity for practicing using the letters in words and phrases to get familiar with spacing, joining letters and just seeing how the style looks when it is in common use. Some people choose to decorate their pages. This is optional. 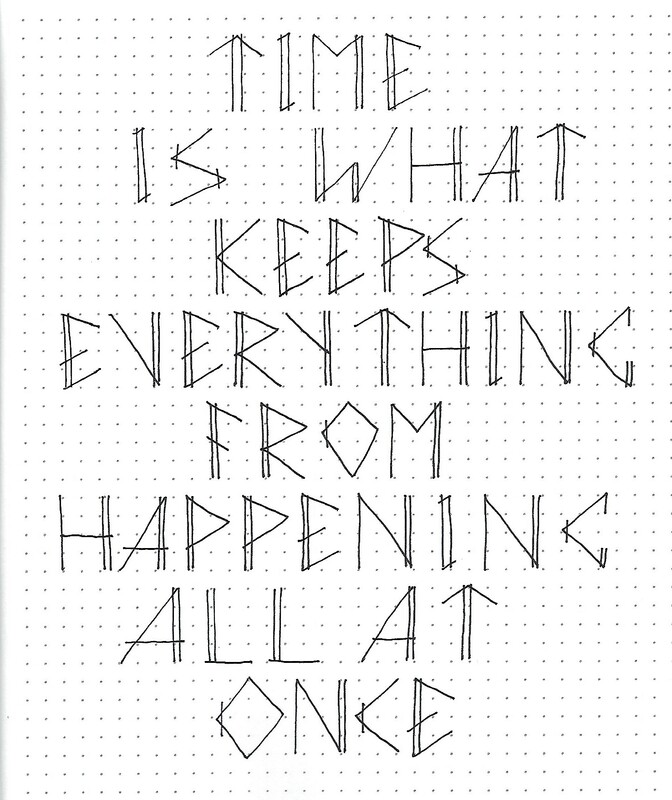 I’ve always found this quote about time to be quite humorous. It has been attributed in various iterations to Einstein but most believe it not to have come from him at all. 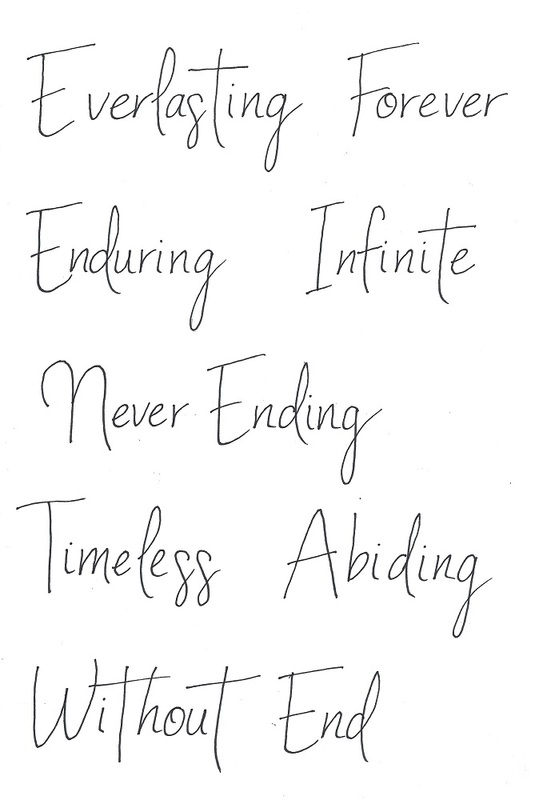 Choose your own quote about TIME to write up for lettering practice. You know why we do all these activities throughout the week, don’t you? It is to train our minds and hands in the proper formation of the letters for the style. It also gives more opportunity for you to develop the stylistic elements that will make it your own. So, it is to your OWN benefit to write longer blocks of text rather than trying to get by with as little as possible. When using this letter style in a looser manner it takes on a casual feel. 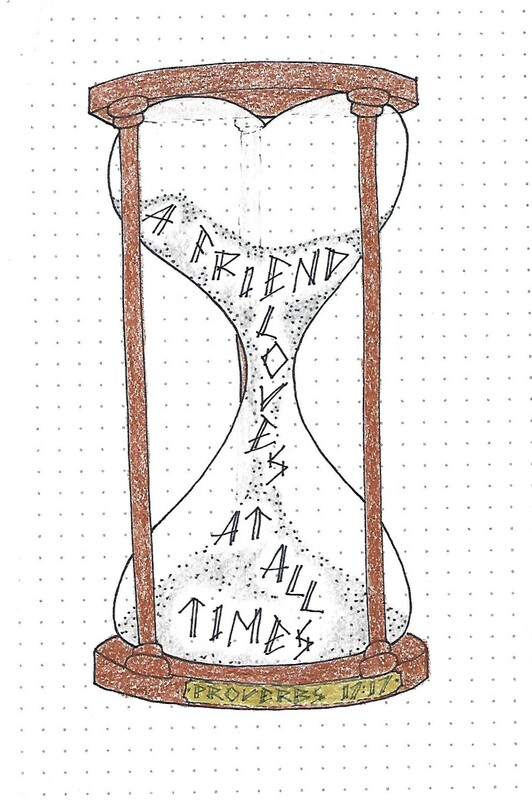 I used mine to write out a scripture inside an hourglass. This is a variation on the one presented in the Drawing Room this week. The scripture reference is on the brass plaque. Have you discovered whether you like to use this as a casual style or more regimented? It helps on the casual usage to toss and turn the letters a bit to dial down the formality. 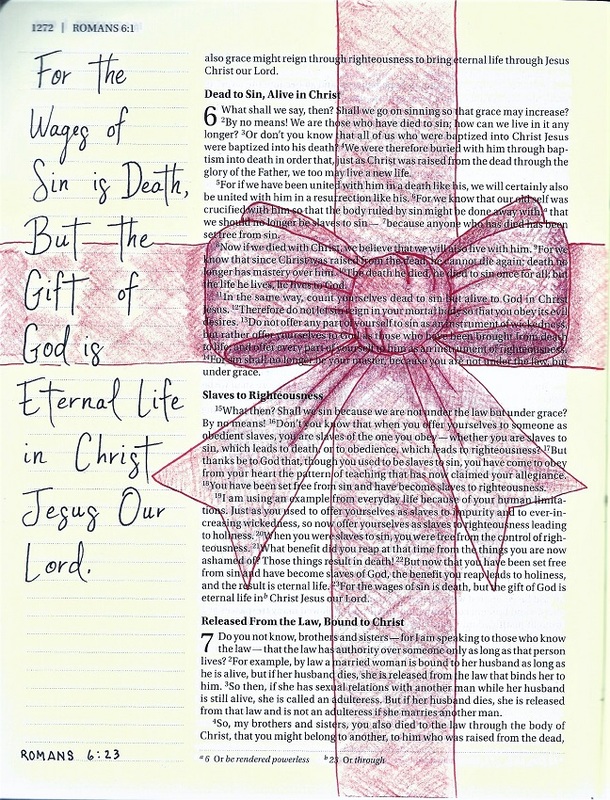 The fifth lesson is when we get to use the lettering in our Bibles. I found a coloring book illustration that I liked for inspiration. I used the same hair style and sleeves but all the flowers are mine. For this scripture I went back to a more regimented usage of the lettering style as it references royalty so needed that formal touch. Don’t forget, we are still using the P-I-E method – Pencil-Ink-Erase. Let us see what scripture you choose to use with the TIME font. So, that's how you teach 5 days of lessons in 5 hours! This week my co-leader Ann had the lettering lesson. In response to a mention from one of the group members, Ann developed a double-line print and taught it with the focus word 'teaching'. The introduction of the font/word. The straight lines get full double lines. Curves get partial double lines. Here's the alphabet. I changed some of my letter forms and where some of the double lines appear. The assignment was to write out words of things that teachers use to teach. I did mine on black cardstock with a Sharpie fine paint marker in white to look like a chalkboard. The marker was absorbed into the cardstock on the first pass so I had to trace all the lines a second time. This is scripture writing day in our notebooks. 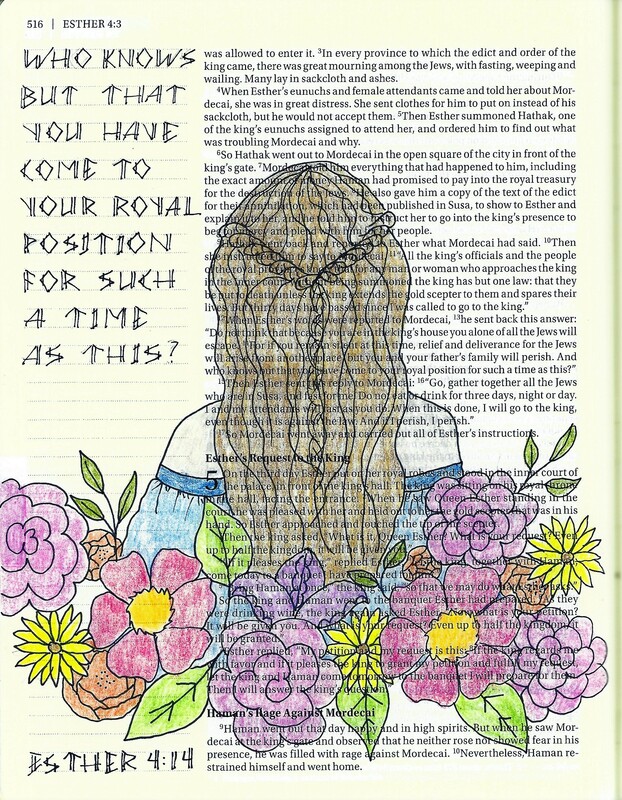 Once I selected my verse I knew it needed to be written out in a Bible drawing. I know from experience that we always use the font in our Bible on Friday. I was so excited about my idea that I did it back on Wednesday! This turned out exactly like I envisioned it, too. I looked up a few references here and there on how to draw elements but the drawing itself is all mine. Back when I did the vellum butterfly pop-up insert in my Bible I thought how neat it would be to do one with angel wings. I found a wing I liked and printed it out as a set with one a reverse image. Then I set it aside to do later. I used to do a lot of parchment craft on cards and still had all the supplies to do this craft. I used Tinta pearlescent ink and a dip pen to trace the wings onto parchment. Then I used a medium ball tool to burnish from the back - heavier at the wing tips and more streaked as they went toward the base. I used a 4-needle tool to pierce around the perimeter and tore away the background, leaving a bridge between the two wings. I folded the wings together and used dry-line adhesive to glue them into the gutter of my bible. I wrote out Psalm 34:7 in an art deco font. I am so pleased with how this turned out - exactly how I had hoped. I don't expect I will use many pop-ups in my Bible but this was a 'must have'. Well, I had a big surprise while teaching this lettering lesson. Several people said it was the hardest they had tried to learn! Really??? I chose this style because I thought I'd give them a break from all the difficult ones we had been doing. Boy, was I surprised at how hard they found it to be. Here is the lesson - as well as some tips I shared with them to help solve their dilemma. Today we’re going to learn a lettering style that is graphic – kind of cartoon-like in all caps. It is one that would be good used in sign making. But our word is still thought provoking. We’re going to ‘LISTEN’. I’ve shown the samples in a variety of sizes so you don’t have to feel locked into making giant letters. It is easily scalable. · - Even if you’re using grid dot paper, start with guidelines to keep your height consistent. · - Add a shadow line to left and bottom, using a diagonal to connect to the letter. · - Ink your letters and erase the pencil (including guidelines). · - Decorate the shadows if desired. · - Color letters as desired. We’re going to use the same steps as yesterday to create our entire alphabet. Since you won’t need to write all those instructions at the bottom of your page, you’ll have room to create a set of numbers, as well. I didn’t decorate my shadows or color my letters as this page will be a reference sheet on letter construction in my lettering notebook. I encourage you all to remember that this lettering style is very casual, imprecise and totally personizable. Do not distress if your letters are skinnier or fatter than the example. No need to worry if the bulges are not consistent. 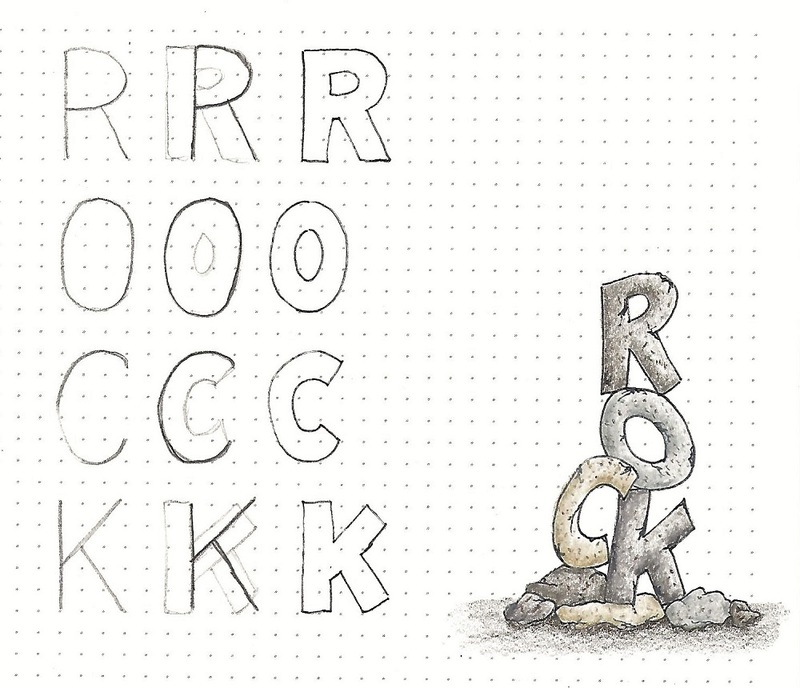 Think of these as some regular block letters that got left out in the sun and have started to melt a little. They wouldn't do that in a precise manner! The thing that will pull them all together in your project is to have the shadow depth consistent. So, make that shadow line an even amount from the letter edge and I think you'll be happier with your results. Use your new lettering style to create a ‘sign’ with a quote on listening. I found this one to be thought provoking. I varied the sizes of the guidelines to emphasize some words and deemphasize others. I did not decorate the shadows on the letters and I used a rainbow order for coloring my words. Lots of options – what will YOU do? You may choose to use a shorter verse with the word ‘listen’ when you write on your practice paper. But doing a long verse provides the practice needed to really get those letter forms into muscle memory. Again, I did not draw or color in the shadows. But I did get to use those numbers we talked about on day two. Look how you can use the same style for punctuation, just bulge the ends of lines and add a shadow. Since this lettering has a distinct shadow, look how much dimensionality you can get by using a white gel pen to add some highlights! Highlight sparingly INSIDE the letter on the UPPER RIGHT with a single curved line. This makes the letters appear to have a rounded surface instead of lying flat. Today we are going to use the ‘listen’ font in our Bibles. Because this is a font that takes up a lot of horizontal room, I chose to turn my Bible and work on an edge-strip. I also saved space by mixing in a script font so the emphasis is on just two key words. 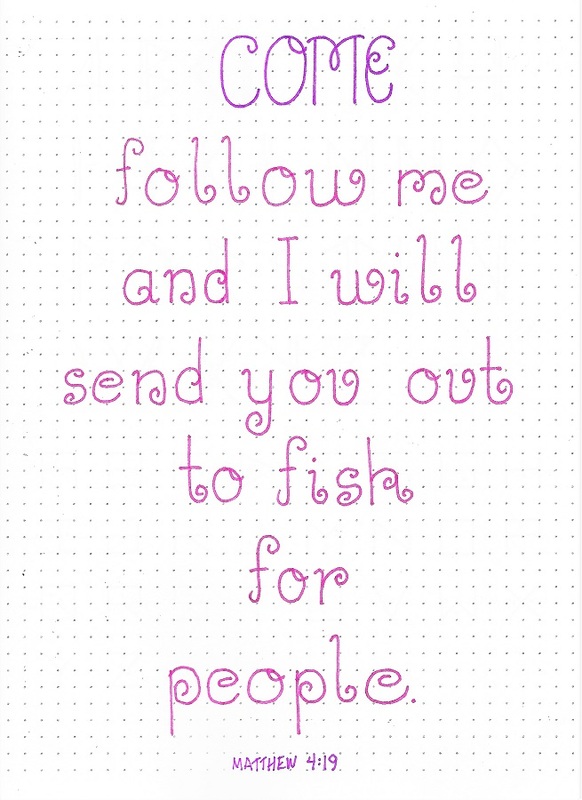 You could also use a simple single-line block print with either all-caps or a mixed case font. I wouldn’t use a faux-brush style with thickened letters as it would then compete visually with the featured lettering. I DID color my shadows for this final piece – with gold gel pen! The addition of the flowers was to fill in some white space and balance the piece visually. Another lettering lesson in the books.